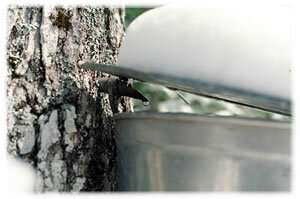 In late February as winter loses its icy grip and spring is just around the corner, the sugar maple trees are tapped. When the days are warm and nights are cold, the sap is collected and boiled down in the evaporator to make fresh maple syrup. 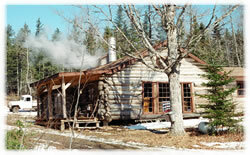 On weekends, from mid March to mid April, the maple syrup operations are open to the public and various activities take place. You can take your family on a horse drawn sleigh ride, enjoy a meal in the lodge with different maple-menu items, have taffy on the snow and visit the sugar shack to watch the syrup being produced, weather permitting. The lodge opens at 9:30 am and has five seatings (by reservation only) – 9:30, 10:30, 11:30, 12:30, 1:30. Sleigh rides run from 10:30 to 2:00 as required at a cost of $2.00 per ride. Bring your family and celebrate spring! Visitors are required to walk a short distance (approximately 600 yards) from the parking lot to our sugar camp. Limited parking is available at the camp for those who are physically handicapped but please phone ahead to advise of such arrangements. This is a gravel road but may be snowy or slippery. Visitors should keep this in mind and dress appropriately. Washroom facilities are of the “Johnny-on-the-Spot” type with handwashing options.